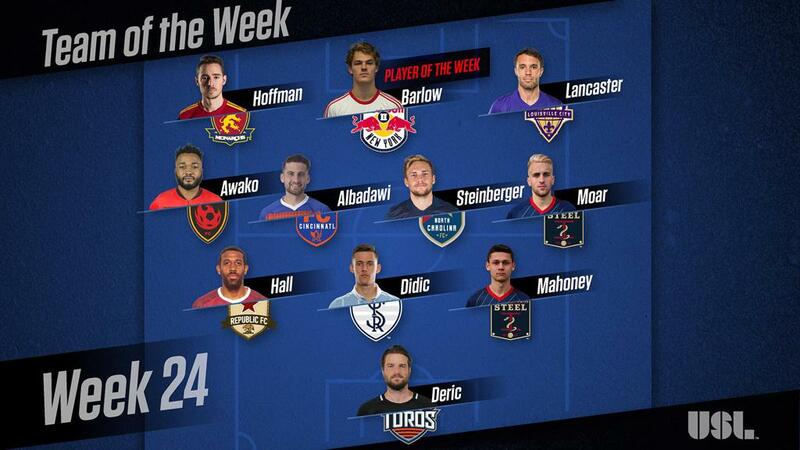 TAMPA, Fla. – New York Red Bulls II forward Tom Barlow has been voted the USL Player of the Week for Week 24 of the 2018 season. Barlow scored a second-half hat trick after being brought on as a substitute for the Red Bulls II to lead the side back from a three-goal halftime deficit to earn a 4-4 draw with the Charleston Battery on Saturday night at MUSC Health Stadium. Barlow received 62 percent of the poll conducted by a national panel of independent media representing every USL market. North Carolina FC’s Zach Steinberger and Bethlehem Steel FC’s Santi Moar finished tied for second with 14 percent apiece. GK – Tyler Deric, Rio Grande Valley FC: Deric recorded a seven-save shutout on the road to lead the Toros to a 2-0 victory against Orange County SC for the club’s first road win of the season on Saturday night. D – Jeremy Hall, Sacramento Republic FC: Hall made five interceptions, three clearances and completed 43 of 45 passes, as Republic FC took a 2-1 victory against Reno 1868 FC at Greater Nevada Field on Saturday. D – Amer Didic, Swope Park Rangers: Didic scored what proved to be the game-winning goal, won six of eight duels overall, completed 54 of 59 passes and recorded seven clearances, as the Rangers took a 2-1 win on the road against San Antonio FC. D – Matt Mahoney, Bethlehem Steel FC: Mahoney won 15 of 20 duels, recorded 14 recoveries and made seven interceptions and seven clearances over the course of victories against Ottawa Fury FC and Nashville SC. M – Gladson Awako, Phoenix Rising FC: Awako notched one goal, two assists and recorded eight key passes to help lead Rising FC to a 4-0 victory against Colorado Springs Switchbacks FC on Saturday night. M – Nazmi Albadawi, FC Cincinnati: Albadawi scored twice, played a key role in a third FCC goal and recorded two key passes during the side’s 5-1 victory against ATL UTD 2 on Wednesday night. M – Zach Steinberger, North Carolina FC: Steinberger had two goals and one assist in his debut for North Carolina, as it swept to a 6-2 victory against the Charlotte Independence on Saturday. M – Santi Moar, Bethlehem Steel FC: Moar scored twice, recorded two key passes, made three interceptions and completed 27 of 33 passes overall in Bethlehem’s 2-0 win against Ottawa Fury FC last Wednesday evening. F – Chandler Hoffman, Real Monarchs SLC: Hoffman recorded a second consecutive brace and added an assist to lead the Monarchs to a 4-0 victory against the LA Galaxy II on Saturday night. F – Tom Barlow, New York Red Bulls II: Barlow scored a hat trick after coming on as a second-half substitute, as New York rallied from a three-goal halftime deficit to draw 4-4 with the Charleston Battery on Saturday. F – Cameron Lancaster, Louisville City FC: Lancaster scored three goals over two games, as Louisville swept to victories against the Charlotte Independence and Richmond Kickers.